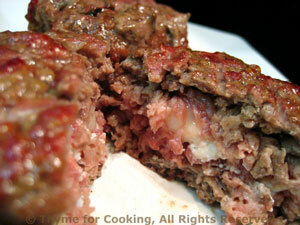 Cheese Stuffed Burgers, Thyme for Cooking gourmet menus. We haven't eaten enough burgers yet this summer either... These are simple, no fuss, with a bit of added flavor. We normally cook them in a grill basket, it just makes it easier. We'll use the other half of the red pepper next week (Friday). These can have a chunk of any cheese you like inside. Try to use something a bit on the firm side so it will stay together and not run out. I just get a small piece of aged goat cheese at the deli counter. Gouda, Muenster, Colby... any would be good! Shape one half into 3 patties. Put a slice of cheese on top of each patty. Divide remaining beef into thirds. Make each into a patty and place on top of cheese. Work edges to seal. Place patties in basket and cook on barbecue grill over direct heat for 4 - 5 minutes per side. Or sauté in nonstick skillet for same amount of time. Remove and serve. This was based on a Potato Leek Cake that I make during the winter. I updated it for summer by adding red pepper and zucchini. It was a bit heavy to 'flip' so you can either turn it, whole, using 2 plates or just turn it in large sections with a big spatula. Either way, let it get nice and crispy first! Wash the potatoes and zucchini, but do not peel. Shred the zucchini and the potatoes using the large whole on a box grater or use a food processor. Put all of the vegetables into a bowl and stir well to combine. Heat oil in a large nonstick skillet over medium-high heat. 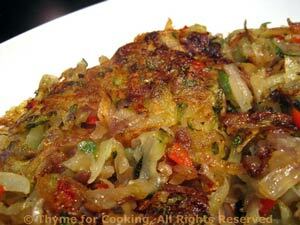 Add vegetables and flatten as best you can with a spatula, reduce heat to medium and let fry. Then you can do one of two things: Put a plate (or tray) on top of the skillet. Grabbing the plate and skillet together (with hot pads) flip them over so that the cake is on the plate. Slide the cake back into the pan to cook the other side, another 10 - 12 minutes. When done, slide onto a plate cut into wedges and serve. Or, carefully turn large sections with a spatula. Pat back together and fry until brown on that side, another 10 - 15 minutes. Slice onto a platter and serve.